We take a look at what almost happened at the Open Championship, while recounting what did. Although the Open Championship was an exciting tournament, with a thrilling final round and a great background to the winner, a lot of the story is of what could have been. Throughout the week we saw players make runs, but inevitably all but Darren Clarke fell back. Phil Mickelson earned just his second top-10 finish in the Open with a T2. Rickie Fowler, no one’s pre-tournament pick to be much of a bad-weather player, fired a third-round 68, putting up possibly the round of the tournament in a driving rain storm. 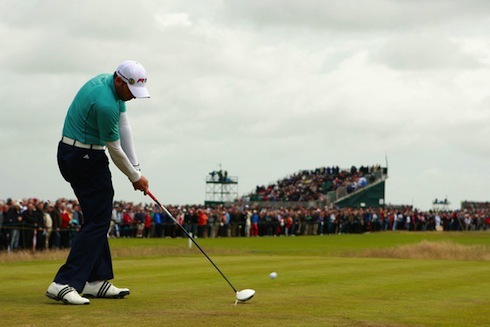 Tom Watson shot four solid rounds near par, and recorded another strong Open finish. Thomas Bjorn, only several months removed from the loss of his father, managed a first-round 65 and was in contention until the end. Bearded Lucas Glover, a player who seems to rise only for the big occasions, was also in contention after a strong first day. Dustin Johnson and Sergio Garcia, both former major-championship chokers, made strong runs on Sunday, but both fell just short. Finally, a long-haired Anthony Kim made a strong push on Sunday, hopefully giving him a kick in the rear substantial enough to get him to the driving range every once in a while. In this edition of Trap Five, we take a look not only at what went down, but what could have happened. What might have been if the bounces had gone the other way, or if the sun had shone at a different time? We examine how the competitor’s lives could have changed had they pulled out the Open Championship. Anthony Kim, coming off a poor start of the year due to thumb surgery and excessive partying, made it into the Open Championship only after the withdrawal of 2010 Players champ Tim Clark. Kim, an extreme hot-and-cold player, made a strong run on the front nine, and it seemed like for a while he has ready to contend. Unfortunately, just as he began to cool off, Clarke, Mickelson, and Johnson pulled away. But what if Kim had won? What if he mounted a charge for the ages, and Clarke was unable to hold him off? The enigma that is Anthony Kim might finally have been cracked. It seems that since his thumb injury Anthony is waiting for a shot of adrenaline similar to what he got back in 2008 with the AT&T National. That win propelled him to a successful Ryder Cup, and a win at the Shell Houston Open in 2010 seemed to do the same for him last year. Kim thrives when the spotlight is on him. When he joins an injured Tiger Woods for an offseason clinic. When he gets hand-picked by Phil to be his Ryder Cup partner. When he sets the Masters record for birdies in a round, with 11. A major win would have given Kim, easily one of the most talented guys on Tour, the fanfare and the acclaim he needs to stay on the straight and narrow, and all we can do now is hope a T5 does the same. Thomas Bjorn was another alternate who contended at the Open. After a first-round 65 put him in the lead, Bjorn couldn’t quite keep it going the rest of the week, carding a 72 and two 71s. Bjorn undoubtedly had a lot of butterflies in his stomach and many demons to conquer. In the 2003 Open Championship, also held at Royal St. George’s, Bjorn was up by three shots with fur holes to go. After taking three shots to get out of a pot bunker on the 16th hole, Bjorn coughed up the lead, and it landed square in the lap of first-time major competitor Ben Curtis. In addition, Bjorn’s father passed this May, and judging by his post-round press conference, it clearly hit him hard. Overcome by emotion, Bjorn was in tears as he discussed the his fantastic first round. A win for Thomas would have given the ultimate closure. Not only would he have been able to put his collapse behind him, but winning a major is the ultimate way to thank your father. Many of us were introduced to the game by our fathers, and to reach the top of your sport, to become Champion Golfer of the Year, would be an unrivaled present. Lucas Glover, 2009 U.S. Open champ and winner of the 2011 Wells Fargo Championship, was tied for first after Friday, and was in a tie for fifth going into the final round. Although a 74 on Sunday took him out of the tournament, Glover seemed primed to make a move. Glover is as unlikely a winner as any. Although he does have a major to his name, Lucas has been mightily inconsistent, with only one win and a heaping handful of missed cuts since his U.S. Open victory. Without a single top ten aside from his win this year, nobody thought Glover would be in the mix. In many ways, if Glover had won he’d be the American version of Angel Cabrera. He’d be a two-time major winner without much else on his resume. Glover, like Cabrera, would have made the most of the relatively limited natural talent that he posses. Glover, though serviceable, has never been a guy who would blow you away with his ability, and two majors is probably the farthest he would have been able to go. To his credit though, his facial hair is much better than whatever Tiger has growing out of his face. Rickie Fowler, like Anthony Kim, is proving to be a complicated story. Like Anthony, he has all the talent in the world, but he hasn’t really broken through yet. Of course, that’s not a death sentence, as he is only 22. But Fowler has had the lead or a chance at the lead in several PGA Tour events so far, and he has yet to come away with a win. In the Open, Fowler followed two even-par 70s with a spectacular round of 68 in a driving rain on Saturday, but failed to get much going on Sunday. He made par on the first 13 holes before finishing two over for the day. Make no mistake – this was no choke. He simply didn’t get it done. If Fowler had won, I suspect the outlook for American golf would be a bit better, or at least people would view it as such. The last few years, where no American has won since Stewart Cink at the Open two years ago, have shown us just how bright the European an international golf outlook is, and the American point of view looks equally as bleak. Fowler winning a major could have changed a lot of that. After all of the accolades thrust on Rory McIlory, Rickie Fowler could have just as quickly given Rory a potential long-time adversary, one that knew how to win and one that could get it done in the clutch. I suspect Fowler isn’t quite there, but it also seems he has a bright future competing with guys like McIlroy and Matteo Manassero for years to come, with or without the 2011 Open Championship. Just a few weeks ago, I questioned whether or not we had seen the last of Phil Mickelson competing for majors, but this week he proved he had a little something left. Armed with a new philosophy on playing links courses, Mickelson put himself in contention to strike on the weekend. One under after Friday, and even par going into Sunday, Phil massacred the first 10 holes with four birdies and an eagle, and walked to the 11th hole at six under, a score that would have won him the Open. Phil’s new “take off the break and jam it into the back of the cup” putting philosophy let him down in the end though, as Phil pushed every putt in sight. Mickelson had four bogeys in six holes, and finished at two under, three off the lead. What would have happened if Phil actually won the Open? Well, probably not a lot. Sure, there would have been a lot of head scratching about how he can come in second at five U.S. Opens without a win, yet make just his second Open Championship top 10 a victory. But Phil isn’t Steve Striker, another major doesn’t exactly complete his career. I don’t think another major would do a lot for Phil’s career. He’s a surefire Hall of Famer, but it’s clear that Phil is winding down, at least a bit. He has injuries that need rest and a family that he would love to spend more time with, two things that are hard to ignore at age 41. Even with a fifth major, Phil would still be on the several-win-a-year pace that he has maintained throughout his career. He would still be near the top of the money list, but never in first. He would still content for majors, but not usually win them. And he would still maintain that go-for-broke strategy that only he can come close to pulling off. This week, in addition to Thomas Bjorn, we had two former major championship chokers contending for the Open; Dustin Johnson and Sergio Garcia. Johnson started the week with three strong rounds, putting him at four under heading into Sunday. Although he started off poorly, with two bogeys in his first six holes, DJ hit his stride by the middle of the round, and he got to five under (the eventual winning score) by 12th hole. On the par-five 14th though, Johnson hit his second shot right of the fairway, on a hole where OB runs just off the first cut and you absolutely cannot miss right. Johnson did, effectively removing him from competition and brining the 2010 U.S. Open and PGA Championship to mind. Although this wasn’t a choke per se, DJ surely couldn’t have felt like he got the most out of his round. If Johnson had won, the redemption would have rivaled that only of Thomas Bjorn’s. After two devastating meltdowns last year, getting his firs major championship would have surely been a huge boost for DJ, at a time when he could really use a pick-me-up. Winless since last year’s BMW Championship, DJ has had a steady year but hasn’t done much on the big stage. He made the cut at the year’s first two majors, but he didn’t contend in either. A win would have been just what Johnson needed. Sergio Garcia has had a whirlwind career for sure. After coming on strong in the early 2000s, and then again in the late 2000s, Sergio hasn’t won an event in nearly three years. Garica nearly won the 2007 Open Championship at Carnoustie, and had an eight-foot putt to to do so, but it – and he – fell short. Garica was then disqualified from the PGA that year for signing an incorrect scorecard, and he gave up the lead in the next year’s PGA on the back nine, again falling at the hands of Padraig Harrington. Garcia, though still winless, has played well this year, and a high finish at the U.S. Open had him primed for a run. Four over after the third round, Garica went on quite the run on the front nine. After making his way to even par through seven holes, Garcia again fell apart, finishing at two over. Garcia might have had more to gain by a victory than anyone on this list. Armed with a swing and talent unmatched by most everyone, it often seems that Garica’s biggest opponent is himself. More than anything, Sergio needs to know that when it comes down to it, he can make the big putt, even if it’s a tap-in. Confidence might be the biggest thing that separates Sergio Garica form a multi-major career, and a win at the Open Championship, his favorite major, would have given him all the confidence in the world. 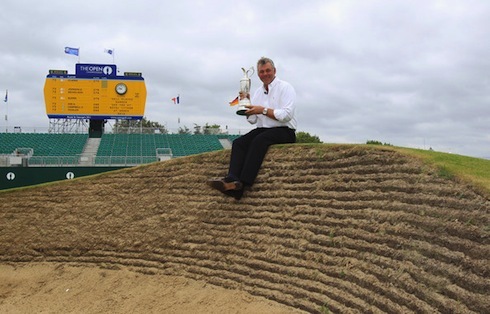 Of course, no Open Championship column is complete without the story of Darren Clarke. Clarke, the sixth highest career money winner on the Euro Tour, has had a career filled with triumph and hard times. Clarke won the 2000 World Match Play over Tiger Woods in the final match, and won another WGC event at Firestone in 2003. Clarke is also an established Ryder Cup player, appearing on the team every year from 1997 to 2006, and he was vice-captain on Monty’s victorious 2010 team. Clarke played on the 2006 Ryder Cup team with a heavy heart, after his wife of 10 years, and the mother of their two children, passed after a bout with cancer. At the Open, Clarke put together solid rounds of 68, 68, and 69 to earn himself the 54-hole lead, and an even-par round of 70 on Sunday gave him the victory, the first major of his career. Unlike Phil, Clarke’s win does complete his career. He’s a borderline Hall of Famer, but clearly one of the most successful European Tour player of all-time. Although Clarke hasn’t played all that much over the last few years, he had never had the last defining moment that a great player deserves, especially after what he went though in 2006. This Open Championship gives him just that. Clarke may possess the best story, but this year’s Open gave us a look into the careers of a lot of the worlds top golfers. Many of could have used a major championship as a way to get ahead, to get into the rest of the majors, and to gain confidence for next year. Who do you think could have used this major win the most? Photo Credits: © Streeter Lecka, © Stuart Franklin, © Stuart Franklin, © Scott Halleran, © Streeter Lecka.